Stars in Shadow is relatively simple and inviting for newcomers to the 4X strategy genre, but also features original mechanics to intrigue 4X veterans, and everything is brought together with a fun, cartoonish art style that complements the fantastical races and nature of this space exploration strategy game. 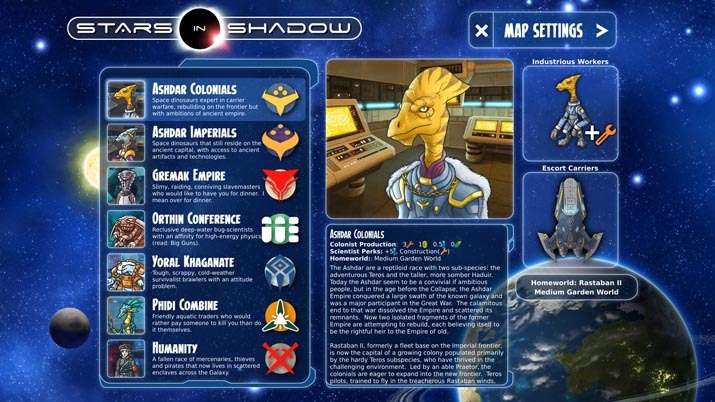 Space exploration meets political strategy in Stars in Shadow from Ashdar Games. Stars in Shadow has been a two-man project for the most part, with some concepts in the works since 2002. The continuous finessing of the title really shows in its approachability; it works perfectly as an introduction for newcomers to 4X strategy and space exploration games, notorious for their complexity and steep learning curves. You can choose from seven different races. Interestingly, the human race is actually one of the most difficult races to play. In Stars in Shadow, humanity is left without a home planet, doomed to wander the stars as a fractured, mercenary race. Whereas most titles create humans as a 'neutral' race, Stars in Shadow actually makes playing as humans just as unique and full of discovery as were you playing as an alien race. How refreshing to see our race treated as more than a blank chassis, a template, for other races! In fact, very few of the races could even be considered humanoid. Each race is given certain advantages and disadvantages based on their culture and physiology. Join the cockroach people for avid researchers and scientists, the terrifying three-eyed yeti people for industriousness and durability, or the snake people, if you want to deal in slave trade and other nefarious exploits. No matter the race you choose, the game starts with a few ships and a homeworld in a newly generated galaxy. The goal is to scout and settle new planets, with each planet working on different research and infrastructure projects. There is little to no tutorial, unless you count the occasional info-blurb that pops up every once in awhile. Though Stars in Shadow is relatively intuitive and has less of a learning curve than other 4X strategy games, there is a short manual accessible from the menu screen, and it is an invaluable tool for understanding gameplay. The other tools that give a little grace to those not used to 4X strategy are the “undo” and “redo” buttons. Instead of having a tutorial tell the player what happens when they make a certain decision, the game allows the player to see what happens, and undo the move if it’s not conducive to their strategy. The gameplay itself is as quick or as slow as you want it to be. All passage of time is done by “turns,” rather than days or years. This takes out a lot of the stress that goes into many 4X strategy games, for better or for worse. Neophytes to the genre might find it a welcome reprieve from a more fast-paced game, but greybeards might find the lack of a ticking clock creates too leisurely a pace for them. After colonizing any planet, the player will have to deal with governing the new, possibly pre-existing, population. These governing duties include anything from managing the happiness or food production of colonies, to overseeing their research and trade management. As your knowledge of the newly-rendered galaxy expands, your empire will come across alien lifeforms with whom you can ally, trade, or battle. There is an option to engage in a battle manually, for those who like a hands-on experience, but the game also allows for an automated setting that bases each battle on modifiers and a dice-rolling mechanic. Battles won on an enemy planet give you the option to invade and colonize. 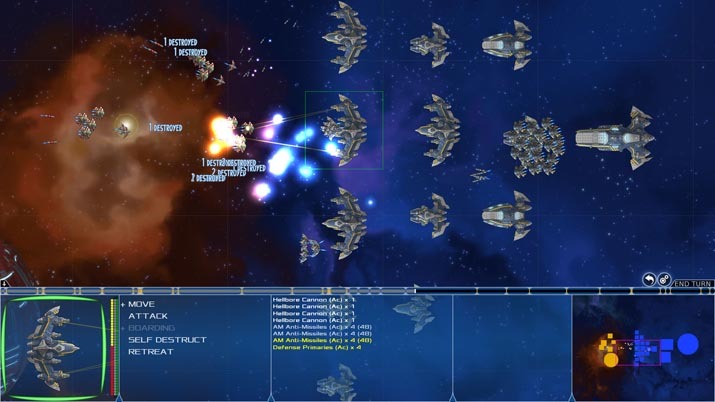 Stars in Shadow stands out with its ship-design mechanic. As the player’s community becomes more and more technologically advanced through research and capturing alien ships, new blueprints for ships become available. It goes even further by then allowing the player to either edit the design of existing blueprints or even create new blueprints, for the more ambitious player. This mechanic alone is so impressive that it could be its own small game. With boundless research, the player finds herself able to build entire fleets of starships outfitted with the best that science fiction can offer, and orbiting shipyards where to dock the ships. The art is fun and cartoonish; the artists really created some new and interesting characters and races. Each race has vastly different architecture and ship designs. For instance, the cockroach-scientist race has a fleet of ships that are reminiscent of pale green cicada shells. They each also have different ranks and colloquialisms, based heavily on their respective cultures. There is a rare attention to detail on the visuals art and aesthetics. The music provides some cool, futuristic beats that change based on the different menus. Stars in Shadow is perfect for novices to 4X strategy games, as one of the more apparent and pleasantly surprising elements of Stars in Shadow is how inviting the game seems to be. In a genre with intense learning curves and little focus on art and atmosphere, Ashdar’s Stars in Shadow is an interesting beginner’s 4X strategy game with creative new elements that will still intrigue veterans of the genre; it walks the line of being complicated, yet is still simple enough to appeal to new players.